A rose may be a rose. But that rose-like fragrance in your perfume may be something else entirely, concocted from any number of the fragrance industry’s 3,100 stock chemical ingredients, the blend of which is almost always kept hidden from the consumer. Makers of popular perfumes, colognes and body sprays market their scents with terms like “floral,” “exotic,” or “musky,” but they don’t disclose that many scents are actually a complex cocktail of natural essences and synthetic chemicals – often petrochemicals. Laboratory tests commissioned by the Campaign for Safe Cosmetics and analyzed by Environmental Working Group revealed 38 secret chemicals in 17 name brand fragrance products, topped by American Eagle Seventy Seven with 24, Chanel Coco with 18, and Britney Spears Curious and Giorgio Armani Acqua Di Gio with 17. This complex mix of clandestine compounds in popular colognes and perfumes makes it impossible for consumers to make informed decisions about the products they consider buying. The federal government is equally uninformed. A review of government records shows that the U.S. Food and Drug Administration has not assessed the vast majority of these secret fragrance chemicals for safety when used in spray-on personal care products such as fragrances. Nor have most been evaluated by the safety review panel of the International Fragrance Association or any other publicly accountable institution. Ingredients not in a product’s hidden fragrance mixture must be listed on the label. As a result, manufacturers disclose some chemical constituents on ingredient lists but lump others together in the generic category of “fragrance.” In fact, “fragrances” are typically mixtures of many different secret chemicals, like those uncovered in this study. On average, the 17 name-brand fragrances tested in this study contained nearly equal numbers of secret and labeled ingredients, with 14 chemicals kept secret but found through testing, and 15 disclosed on labels. Widespread exposure and a long-standing culture of secrecy within the fragrance industry continue to put countless people at risk of contact sensitization to fragrances with poorly tested and intentionally unlabeled ingredients (Schnuch 2007). 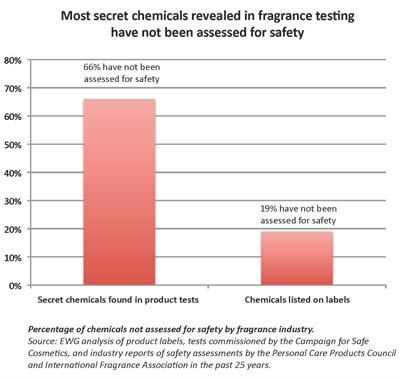 According to EWG analysis, the fragrance industry has published safety assessments for only 34% of the unlabeled ingredients (for details of the analysis, see Methods section). The unassessed chemicals range from food additives whose safety in perfumes has not been assessed to chemicals with limited public safety data such as synthetic musk fragrances, which accumulate in the human body and may be linked to hormone disruption. Some chemicals that are disclosed on the labels of the products in this report also raise safety concerns. They include sunscreen and ultraviolet-protector chemicals associated with hormone disruption (Schlumpf 2004) and 24 chemical sensitizers that can trigger allergic reactions (European Commission Scientific Committee on Cosmetic Products and Non-Food Products (EC) 1999). To make matters worse, FDA lacks the authority to require manufacturers to test cosmetics for safety, including fragranced products, before they are sold to consumers. As a result, people using perfume, cologne, body spray and other scented cosmetics like lotion and aftershave are unknowingly exposed to chemicals that may increase their risk for certain health problems. Source: EWG analysis of 91 chemicals in 17 products ñ including 51 chemicals listed on product labels, and 38 unlabeled chemicals found in tests commissioned by the Campaign for Safe Cosmetics ñ combined with analysis of chemical hazard and toxicity data from government and industry assessments and the published scientific literature. Secret chemicals: Laboratory tests revealed 38 secret chemicals in 17 name-brand products, with an average of 14 secret chemicals per product. 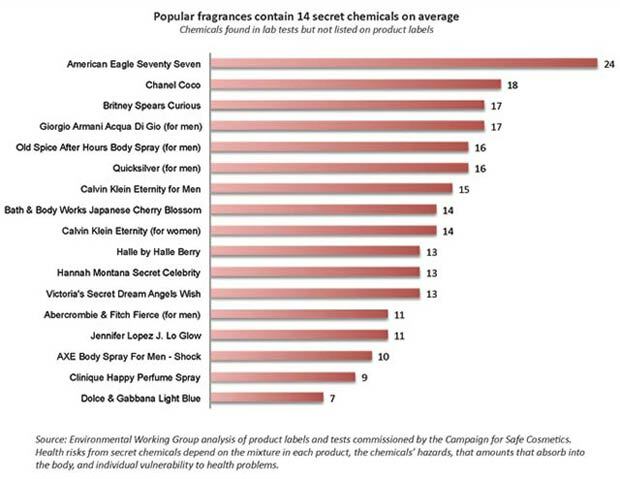 American Eagle Seventy Seven contained 24 secret chemicals, nearly twice the average found in other products tested. Multiple sensitizers: The products tested contained an average of 10 chemicals that are known to be sensitizers and can trigger allergic reactions such as asthma, wheezing, headaches and contact dermatitis. All of these were listed on product labels. Giorgio Armani Acqua Di Gio contained 19 different sensitizing chemicals that can trigger allergic reactions, more than any other product tested. Multiple hormone disruptors: A total of 12 different hormone-disrupting chemicals were found in the tested products, with an average of four in each product. Three products each contained seven different chemicals with the potential to disrupt the hormone system: Halle by Halle Berry, Quicksilver and Jennifer Lopez J. Lo Glow. In each product, six of these chemicals mimic the hormone estrogen, and the seventh is associated with thyroid effects. Some of these potential hormone disruptors were listed on labels; others were undisclosed and were uncovered in product testing. Widespread use of chemicals that have not been assessed for safety: A review of government records shows that the U.S. Food and Drug Administration (FDA) has not assessed the vast majority of fragrance ingredients in personal care products for safety. The Cosmetic Ingredient Review (CIR), an industry-funded and self policing body, has assessed only 19 of the 91 ingredients listed on labels or found in testing for the 17 products assessed in this study. The International Fragrance Association (IFRA) and the Research Institute for Fragrance Materials (RIFM), which develop and set voluntary standards for chemicals in the “fragrance” component of products, have assessed only 27 of the 91 ingredients listed on labels or found in testing for the 17 products assessed in this study, based on a review of assessments published in the past 25 years. Everyone is impacted by fragrance. The Campaign commissioned a laboratory analysis of men’s and women’s fragrances as well as scented products marketed to teens of both genders; all products tested contained a range of ingredients associated with health concerns, such as allergic sensitization, and potential effects on the endocrine system or reproductive toxicity. Products were tested by Analytical Sciences, an independent laboratory in Petaluma, California. The lab found, in all, 40 chemicals in the tested fragrance products. Thirty-eight of these were secret, or unlabeled, for at least one of the products containing them, while the other two were listed on all relevant product labels. Ingredient labels disclosed the presence of another 51 chemical ingredients, giving a total of 91 chemical ingredients altogether in the tested products, including hidden and disclosed ingredients combined. Of the 17 products tested, 13 were purchased in the U.S. and four in Canada. When sprayed or applied on the skin, many chemicals from perfumes, cosmetics and personal care products are inhaled. Others are absorbed through the skin. Either way, many of these chemicals can accumulate in the body. As a result, the bodies of most Americans are polluted with multiple cosmetics ingredients. This pollution begins in the womb and continues through life. Numerous other products used daily, such as shampoos, lotions, bath products, cleaning sprays, air fresheners and laundry and dishwashing detergents, also contain strongly scented, volatile ingredients that are hidden behind the word “fragrance.” Some of these ingredients react with ozone in the indoor air, generating many potentially harmful secondary air pollutants such as formaldehyde and ultrafine particles (Nazaroff 2004). People have the right to know which chemicals they are being exposed to. They have the right to expect the government to protect people, especially vulnerable populations, from hazardous chemicals. In addition to required safety assessments of ingredients in cosmetics, the laws must be changed to require the chemicals in fragrance to be fully disclosed and publicly accessible on ingredient labels. As our test results show, short of sending your favorite perfume to a lab for testing, shoppers have no way of knowing exactly which of the 3,100 fragrance ingredients may be hiding in their beauty products or even in their child’s baby shampoo. This study focused on several categories of chemicals – specifically volatile compounds, semi-volatile compounds and synthetic musks. The laboratory analyses, while thorough, were not exhaustive, which means that additional chemicals of concern may also be present in the tested products.